A water and sedimentation basin or pond is designed and constructed to handle anticipated excess runoff and sediment from an area of land depending on slope, rainfall, and land cover. Because sediment basins can slow the flow of surface water and collect runoff, they can be used to capture and divert sediment and run-off and potentially prevent it from entering other fields, properties, ditches and streams. Water and sediment basins must be sized to accommodate the sediment load and excess runoff anticipated above that of natural predicted runoff. In addition, a primary spillway and an emergency spillway must be installed to prevent basin failure. 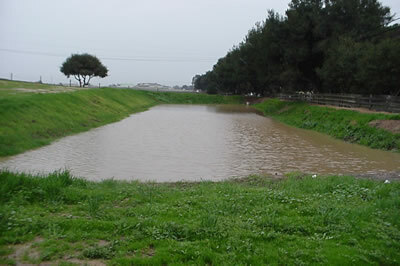 A sediment basin should be designed to have no effect or reduce the likelihood of flooding on the ranch. Alternatives for sediment clean out, disposal and/or possible treatment to prevent the introduction of sediment-borne pathogens onto cropland should also be incorporated in the sediment basin design and management.